Reale Seguros provides most types of insurance in Spain. Reale is part of the Reale Mutual Group of Italy which was founded in 1828. Reale has 285 offices throughout Spain as well as more than 2800 agents representing the company. they offer all the usual popular types of insurances such as golf insurance and private health insurance, below we list other types of insurances with explanations. We feel we must mention Reale Seguros because they are such a large company and our insurance in Spain section simply must cover them, however, we do like to recommend companies offering policies in English and who you can talk to in English, this isn’t necessarily the case with Reale and we note that their website is only in Spanish at the present time. Reale Seguros Insurance are one of Spain’s largest providers of motor insurance in Spain, also known as car insurance. Extras that you may not get with other companies policies include accident insurance, points recovery, recovery of fines, legal defence, medical assistance, funeral expenses and breakdown cover. If you have purchased property in Spain you will need to take out house insurance in Spain. Reale Insurance Spain offer home contents insurance and buildings insurance in Spain as well as community insurance. House insurance is provided for a number of different situations, whether your house is your main residence or secondary residence, whether it is let out and rented or whether it is empty. House insurance policies cover buildings and contents in the event of fire, explosion, flooding, theft, electrical damage as well as giving you legal defence and public liability. Accident insurance covers you personally should you be involved in an accident you will be covered in case of total and temporary invalidity giving you medical assistance and insuring you in case of death. Liability insurance provides you cover against damage caused to third-party people or property. Business insurance is a must if you have a shop, office, warehouse or factory. You need this insurance to cover you for the buildings, the contents, theft, flooding, loss of earnings, legal defence and public liability insurance. We are looking for independent reviews of Reale Insurance so if you have used them please let us know your experiences and any comments you might have such as how their premiums and quotes compared to other insurance companies in Spain, this will help other people searching for insurance in Spain. Tell us whether you think Reale Insurance offer cheap insurance in Spain and tell us whether you think the service is good and if you believe they offer good value for money. Page Summary: Reale Seguros are one of the longest-established and best-known insurance providers in Spain. 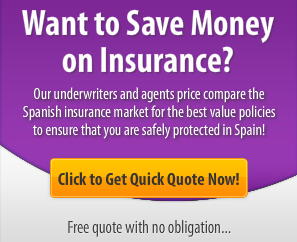 They provide quotes and coverage for most types of insurance you would need in Spain. ilDo not insure anything with Reale Seguros. They are the worst. First they offer you peanuts for the dammage you had. They don’t even look at the invoices you give them for the reparations you had done. If you make a complaint it takes them months to reply. They ask for more information to make it seem as if they’re taking you seriously. Then again it takes them months and months to reply. At the end of it all they leave you no choice and you agree with the peanuts they have offered you in the beginning. Better then nothing, you think…..But you end up getting……nothing…..Why? Because your original claim has past its legal period of 12 months. If you don’t come to an agreement within 12 months, your file ends up in the garbage and they end up paying nothing. That’s what happened to me. Since it’s a community policy for an apartment building I have no options. Now seriously thinking about selling the place. Imagine what would happen if something serious would happen…..I can’t even think about it. Do not insure with Reale if there is any chance you are thinking of selling your villa. We paid our yearly premium in November 2016 not knowing when our house would sell. However we managed to sell our house on 18/01/2017. After contacting Reale and sending various proof of sale they have now informed us, yes , they have terminated our policy but will not refund any money. The consumed 257.91Euros that we are owed will be available for any new contract I would like to have with them until 23/01/2019. As I no longer own a house in Spain I do not think I will need any new contract with them. The company’s politics do not allow restitution I have been informed. They suggest I contact my broker but cannot promise anything. Very disappointing from a large company. So no I won’t be recommending them. Hopefully I will have better luck with the broker. I do not recommend doing business with Reale Insurance.es. Once you have insurance from them, they will automatically take money from your bank account to pay for the renewal. I have had bad experiences with Reale. Firstly, they do speak English, secondly, they are rude on the telephone and won’t let you explain the problem. If you inform your bank within a month of noticing a payment has been taken (without your permission), your bank will stop the payment. Contact your Broker who will help you with the problem.